This species offers a striking recent demonstration of birds’ mobility and adaptability. Little Egrets used to be rare visitors to Britain and until 1991 records were considered by the British Birds Rarities Committee. This was changed by an influx in 1989, starting in July, amounting to more than 100 birds, probably post-breeding dispersal from colonies in north-west France (Combridge & Parr 1992). They first bred in 1996 in Britain, at two sites in Dorset and in Cornwall, and since then have built up to a number of substantial colonies spread across most of southern England, with continued northward expansion. Most, but by no means all, breeding Little Egrets are associated with Grey Heron colonies in tall trees; being later breeders, the egrets join an active heronry and benefit from the social interaction and an element of communal defence. The report of the Rare Breeding Birds Panel shows that the UK breeding population in 2004 was 354-357 pairs at 36 sites in 16 counties (Holling et al 2007), of which the birds in Cheshire and Wirral were the farthest north. In Cheshire the first authenticated record was in 1982, followed by others in 1984, 1988 and 1990. All of these sightings were during May, typical of spring over-shoots from breeding sites in continental Europe; the national influx in autumn 1989 brought single birds to Clwyd and Derbyshire but not Cheshire and Wirral. In 1992 a bird was seen on the Dee in July/ August and from 1993 onwards Little Egrets were found much more often in the county, in different months and staying longer, with several birds together on occasions. 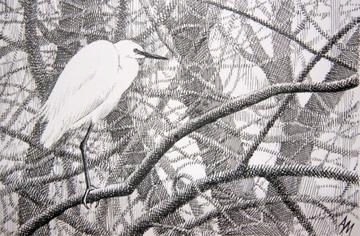 In 1995 two birds at Frodsham Marsh collected twigs and reeds and tried to construct a nest within a flooded hawthorn hedge, a year before Little Egrets first bred in southern England. In the years following that attempted breeding, which would count as ‘probable’ under Atlas definitions, birds were seen in ever-increasing numbers and more widely spread across the county until 2001 when one pair of Little Egrets bred at Frodsham Marsh, raising one chick in a nest in a flooded hedge just one metre below an active Grey Herons’ nest (Morton 2001). No more birds bred in Cheshire and Wirral until the start of this Atlas period in 2004 when a pair nested in Chester Zoo, one of the birds being a ringed individual that had originally escaped from the zoo in 1998 and had flown around the county for six years before pairing with an apparently wild bird. As at Frodsham, nesting at Chester Zoo was not repeated in the following year but 2005 saw the start of an egret breeding colony in the county when birds nested in private woodland near to Inner Marsh Farm RSPB Reserve (Wells 2005). The birds were not studied in detail at their nests, but from observation of family parties it is thought that four pairs nested, fledging 15 young. These numbers increased in 2006 to ten pairs fledging 40 young. In the first five years of establishment of breeding colonies at various sites in southern England, the average productivity was two or three chicks per pair (Brown & Grice 2005) and the phenomenally high figures from the Dee estuary site presumably indicate perfect feeding conditions. Their diet is likely to be, as elsewhere in Europe, mostly small fish and eels up to about 6 cm in length; they take plenty of insects, crustaceans and frogs but the energy content is low compared to fish (Voisin 1991).